I am excited to be participating for the first time in the Fall 2009 Blogger's Quilt Festival hosted by Amy at Park City Girl. This quilt, made a few years ago, is one of my favorites. I made it from reproduction prints purchased on my trip to the Houston Quilt Festival in 2005. I brought home a lot of reproduction prints from that trip - couldn't resist. I haven't been back to Festival since, but DH has promised to take me next year... in the meantime, this quilt is a great reminder of that visit to Houston. I also pieced the back so I could include as much of my fabric as possible. Thanks for stopping by and thanks to Amy for hosting this event. The back is as gorgoeus as the front. What a neat memory quilt to have and remember your trip and to see and look forward to the next one! Thanks for sharing! Wonderful quilt, Dorothy! I love the way you did the back art! What a wonderful quilt - colors, pattern - everything and I love the back. 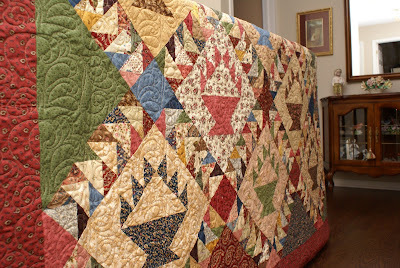 My eyes also caught the fabulous pieced quilt on your right sidebar - is that a Karen Stone pattern? Your colors make everything sing! That is such a great quilt! And I love the pieced back. OMG! 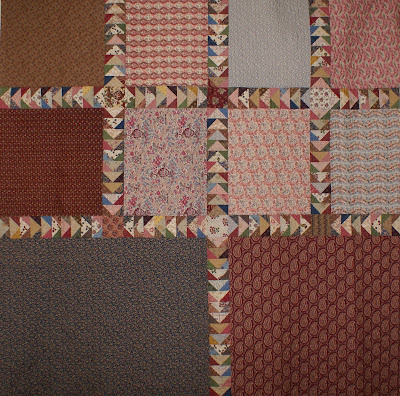 Were you dreaming flying geese while you were making the quilt. It is beautiful! Beautiful quilt!!! Love all the fabric. Thanks for sharing. Beautiful quilt. I love the lovely soft colors you chose. Well done! This is a beauty! all the work on those geese has not been in vain!!! they are perfect! Absolutely beautiful quilt. 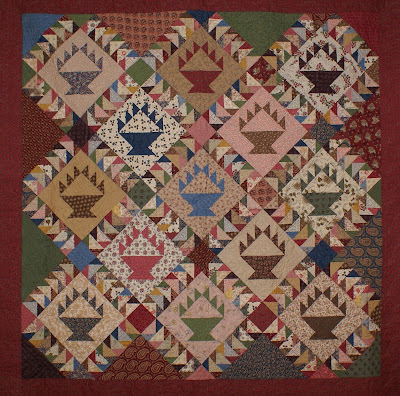 Thanks for participating in the Blogger's Quilt Festival. Beautiful quilt. Love the colors. Love your cats, too! Wow! This is stunning. The back too! Just gorgeous. Its beautiful! I love repo prints too. Wow! It's gorgeous. I love it. I adore the muted colors. This is so beautiful! It is so beautiful and I love the backing. Oh my what a beautiful quilt! Kind cheerful beautiful quilt . Stunning quilt and the back is beautiful too! It's BEAUTIFUL! Your piecing looks perfect - front AND back!!! ; ) Love the ways it's quilted too. Thanks for sharing! And, I hope you do get to Houston next year! I love baskets! Your quilt is beautiful!